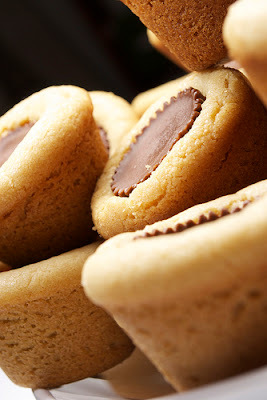 Place peanut butter cups in the freezer (there’s no need to unwrap them; just place the whole bag in the freezer) for 20 minutes. In a small bowl, whisk together the flours, salt, and baking soda. Set aside. In the bowl of your electric mixer (or with a hand mixer), beat the butter. Add the sugars and beat until light and fluffy (about 2 – 3 minutes).Â Add the eggs, one at a time, beating well after each addition. Beat in the vanilla extract. Add the flour mixture. Mix until a soft dough forms. Shape into 1-inch balls. Press dough balls into ungreased mini muffin tins, making an indentation in the middle with your thumb. Bake in preheated oven for 8-11 minutes. Remove from oven and immediately press a miniature peanut butter cup in the center of each cookie.